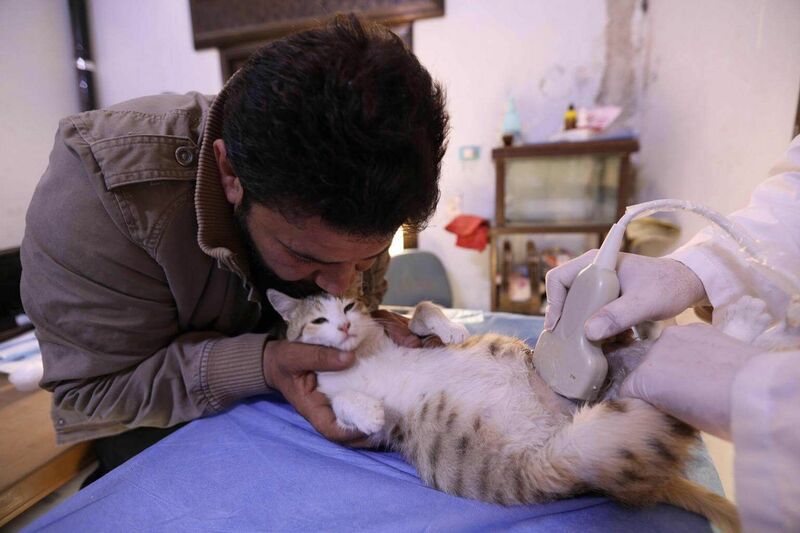 KAFR NAHA (Syria) (AFP) - At an unlikely cat shelter in rebel-held northern Syria, Mohammed Alaa al-Jaleel gently holds a feline patient on her back as an ultrasound probe is rolled across her pregnant belly. "If you want to show mercy to people, start by showing mercy to everything else," says Jaleel, who runs Ernesto's Cat Sanctuary - named after his favourite furry friend. The 43-year-old, who grew up in Syria's second city Aleppo, has been mad about cats since he was a boy. When war broke out in 2011, he put down his tools to become an ambulance driver to help ferry the wounded - but never stopped bringing food to his feline friends. But in late 2016, the regime ramped up its deadly bombardment of Aleppo's opposition-held neighbourhoods as it sought to regain control of the whole city. "We started fleeing from neighbourhood to neighbourhood until, in the end, we escaped the city altogether," Jaleel recalls. Determined not to leave them behind, he and fellow feline fans managed to save 22 of the city's cats. "We gave each family two cats in a plastic vegetable basket," Jaleel says. "He would zip in and grab food from right under the noses of the other cats, just like a Sukhoi jet," he tells AFP. Syria's war has killed more than 350,000 people and displaced more than half its pre-war human population, as well as many of its domestic animals. After fleeing Aleppo, Jaleel set up his second shelter - named after Ernesto - in early 2017 and housed 18 of the 22 smuggled cats in the animal oasis. "The cats don't just stay in just one house. They swop with each other and sleep in all of them," Jaleel says, referring to rows of marble cubes with cat-sized entrances, engraved with names like Pouncer and Rose. "We treat all sorts of animals here for free: horses, cows and even chickens," Jaleel says. "There are no vets where I live. I asked people and they pointed me to the sanctuary," he says. "I was so surprised to find this kind of thing existed during this war we're all living," says Watar. "I saw them treating all sorts of animals. It's really beautiful." Still, war is never far away: the sanctuary's main building bears the marks of gun fire. Last month, it cancelled a children's party after a young boy was shot near the shelter, according to its English-language Facebook page. Even the shelter's cats are treated for war wounds, says the centre's vet, Mohammed Yusuf. "Just like many people are wounded by all the different weapons in the area, animals too suffer the same injuries," he tells AFP. "We're living in a war and facing severe shortages of veterinary medicines for wounds as well as vaccines," Yusuf says. "We examine them and diagnose how many foetuses there are and when they are due, and we prepare to welcome the new births," Yusuf says.